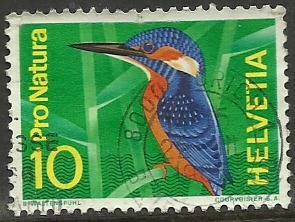 This is the first bird stamp produced by Switzerland , 1966 River Kingfisher (Alcedo atthis) for a publicity issue for the Preservation of Natural Beauty. Other names for this bird are Common Kingfisher and Eurasian kingfisher. Postmarked in Zurich, its a very colorful and popular bird seen on more than 100 different stamps.